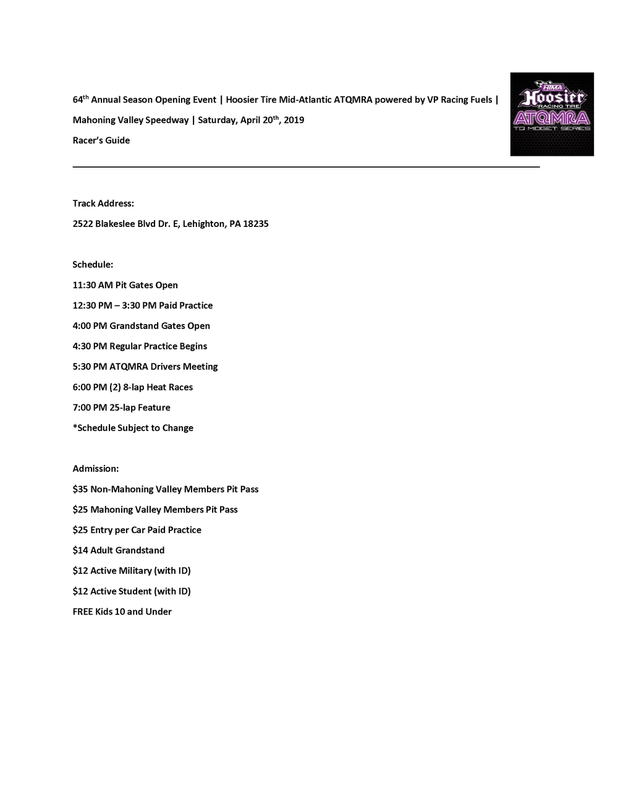 Hoosier Tire Mid-Atlantic and VP Racing Fuels are proud to present the “Fast Start” Award to all ATQMRA competitors at the organization’s season opening event on April 20th, 2019. The Hoosier Tire Mid-Atlantic ATQMRA presented by VP Racing Fuels is set to embark on a new season. In doing so, a strong buzz is in the air as the anticipation for drivers to hit the track continues to build. Both the series’ title and presenting sponsor understand the importance of drivers getting a fast start to a brand new season. Due to this, the ATQMRA is proud to formally announce the 2019 “Fast Start” Award to all Mahoning Valley Speedway opening night entrants. Hoosier Tire-Mid Atlantic will be donating a RR Tire (LC5, USAC) while VP Racing Fuels will donate one, 5 gallon container of fuel to each entrant for the first race of the 2019 ATQMRA Season. Any competitor with a full-time, 2019 ATQMRA season membership, who enters their car to compete in the season opening event at Mahoning Valley Speedway on Saturday, April 20th will be eligible to take advantage of this opportunity from sponsors Hoosier Tire Mid-Atlantic and VP Racing Fuels. For more information about Hoosier Tire Mid-Atlantic and VP Racing Fuels, visit the “sponsors” tab. For more information specifically about the ‘Fast Start’ Award, contact our Public Relations team directly at pr@atqmra.com. Geoffrey Sutton is set to compete for legendary car owner Alan Mollot in his famed #51 Lindblad Chassis during the 2019 Hoosier Tire Mid-Atlantic ATQMRA powered by VP Racing Fuels season. Sutton, a four time ATQMRA feature winner and 2014 Rookie of the Year award recipient, brings a wealth of experience to the already stout Alan Mollot Racing Team. Sutton will join teammate Joey Bailey, who led the ATQMRA in total feature wins in 2018. Sutton is expected to compete in select races in the #51 in 2019, with a full schedule to be announced on a future date. The Hoosier Tire Mid-Atlantic ATQMRA powered by VP Racing Fuels kicks off their 64th season at Mahoning Valley Speedway on Saturday, April 20th, 2019. For more information on the Premier TQ Midget Racing Organization, visit our facebook or instagram. 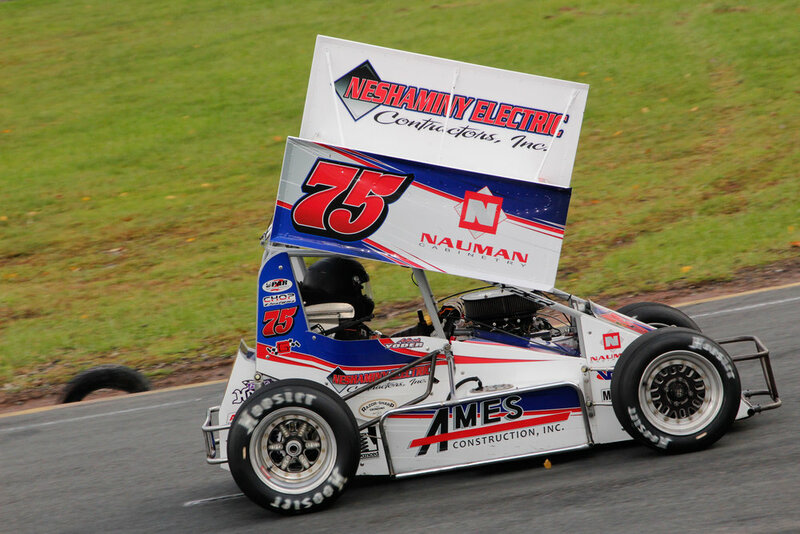 While Mark Yoder did not compete in the Indoor Auto Racing Championship Series this winter, the cold weathered months were anything but relaxing for the driver of the #75 Ames Construction/ Neshaminy Electrical Contractors Hyper Chassis. “We spent a good bit of the off-season rebuilding the our car and adding some updates to it which will help us out with speed and handling on race day,” stated Yoder. The team’s hard work will surely pay off and for good reason. Yoder is preparing for a full season, championship run in the 2019 Hoosier Tire-Mid Atlantic ATQMRA powered by VP Racing Fuels season. On the ATQMRA off-weekends, don’t be surprised to see Mark and his team sling some dirt in his micro-600 as well. Catch Mark and the rest of the Hoosier Tire Mid-Atlantic ATQMRA powered by VP Racing Fuels storm into the Lehighton Pennsylvania’s Mahoning Valley Speedway on Saturday, April 20th 2019 to kick off a brand new season. This week the Hoosier Tire Mid-Atlantic ATQMRA powered by VP Racing Fuels made a pair of announcements regarding media coverage for the series beginning in 2019. Alan Piquette, head contributor for TheRacingTimes.net will be bringing ATQMRA content to race fans on not only a regional level, but a national level as well. “At The Racing Times, we perfectly understand that auto racing fans have a never ending thirst for information, stories, and written material,” as stated on the websites bio page. Alan and his team will be reporting the stories you want to hear about the ATQMRA. Driver interviews, scheduling information, podcasts and more will be available around the clock for fans to have unlimited access to throughout the 2019 campaign. A second announcement this week was made to introduce Matthew Weirnasz, who is the contributing Motorsports writer for WWLP-22 News, based out of Chicopee, Massachusetts. 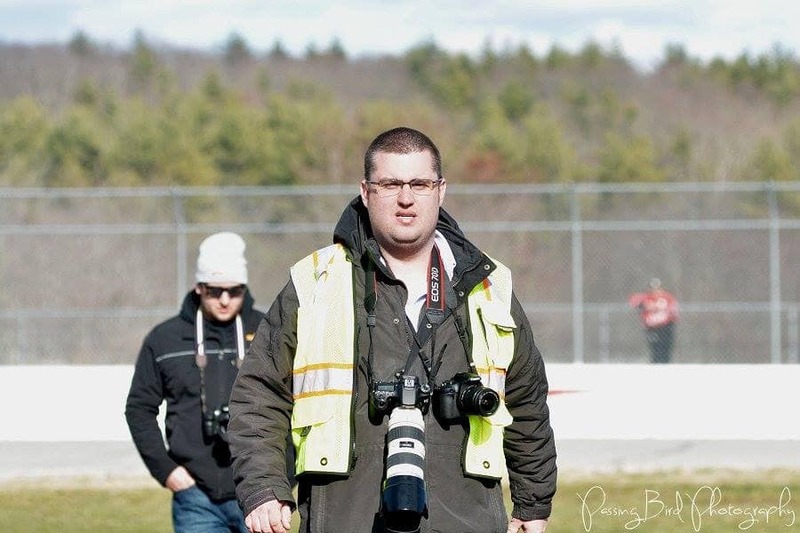 Matt will be seen at multiple tour events this year, bringing extensive coverage to race fans particularly within the New England market. The Area Auto Racing News (AARN) will continue to feature multiple stories and post-race press releases throughout the 2019 ATQMRA season. The Hoosier Tire Mid-Atlantic ATQMRA powered by VP Racing Fuels will kick their season off on Saturday, April 20th2019 at the Mahoning Valley Speedway in Lehighton, Pennsylvania. Be sure to check out the series on Facebook at facebook.com/atqmra for more information.